After David Whyte's reading, later that evening I’m talking to Gary, a qualified forensic anthropologist, although he now works in IT to earn more money. He had once worked on writing the software for a model of how bodies drift in water – in an estuary, for example, with a tidal flow. 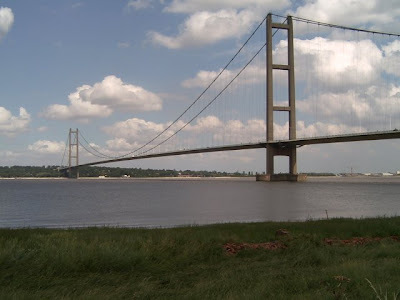 In the mid-seventies, as a camera assistant with a film crew, I had worked on a programme about the building of the Humber Bridge. I told Gary how impressed I had been by the model of the Humber estuary that we had filmed in a huge shed at the National Maritime Institute at Teddington. It was every model enthusiast’s dream – a fully functional working model of the Humber estuary complete with tides and flows. What fun to press the button for High Tide or River In Full Spate. It had been built to model the water flow around the bridge’s towers.